An early patrol organization was formed after World War II, which was supplemented by the Stockton Ski Patrol in the 1950’s, with assists from the Heavenly Valley Patrol and other visitors from neighboring areas. In the summer of 1961, the Modesto Patrol was organized, with four charter National patrollers, and in coming years the Modesto Patrol assumed a growing role at Dodge Ridge. At the time, patrolling wasn’t complicated; it required considerable time and commitment, an advanced first aid card, strong skiing ability and a desire to help the skiing public. In 1961, Dodge Ridge had one chair lift, which is now Chair #3. The chair had a midway station where one could get on, but not off. “The Face”, then much rockier than today, was for experts only, and the only grooming was by patrollers on their skis. Often, after a storm, the patrollers would spend the entire morning stamping out the “Face” and other runs for the public. There was also a platter pull where Chair #2 is today, and Poma lifts where Chair 4 and 6 are today. Dodge was then, as now, a successful and well-appointed ski area, with the old Prospector Lodge large and spacious for its time. In the 1970’s and 1980’s, a separate patrol, made up of residents and homeowners in and around the Pinecrest to Miwuk Village area, was formed to become the Sonora Pass Patrol. For years the two patrols served Dodge Ridge, working as partners, though with separate organizations. By the late 1980’s it became apparent to both the area and to the two patrols that a single, unified patrol would be beneficial, and the two patrols were merged to become the Prospector Ski Patrol. 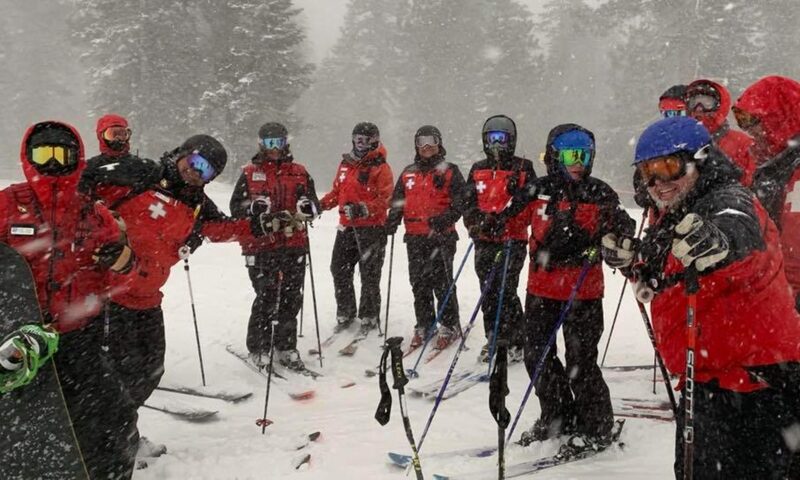 Since that time the Prospector Patrol has frequently been judged best ski patrol in both the Mother Lode Region and Far West Division, and in 1996-97 was voted runner-up as National Patrol of the Year, out of more than 600 patrols system-wide. In 1967, the Patrol Leader from Heavenly Valley and his assistant discussed the idea of forming an organization which would both train and educate the full time professional patrollers of the western U.S. In the season of ’69-’70, a group of patrollers representing ski areas from all over California and Nevada met and decided on a name for their new organization, The Far West Professional Ski Patrol Association “FWPSPA”. But it wasn’t until the spring of ’71 that FWPSPA had it’s first successful clinic. The 57 attending patroller’s skiing and toboggan skills were tested, and a written test was given to evaluate additional patrol knowledge. There were also clinics given on first aid, weather, snow surveying, explosives, and Monty Atwater provided an avalanche demonstration. In 1998 the FWPSPA Board of Directors voted to rename the organization the “Association of Professional Patrollers” to embrace the increasing membership from the Pacific Northwest, Rocky Mountain and Intermountain states. Based on the same idea these two patrollers had over thirty years ago, APP’s goals are to supply training, and education to professional patrollers, and to expect a high standard of skills and knowledge from our Certified members. The association has evolved into a non-profit organization, with a membership of approximately 400 men and women throughout the west. The Certification program is an ongoing forum for developing and maintaining skills, requiring members to regularly train, teach, and judge. The curriculum consists of nine categories, examining proficiency and technical knowledge in: skiing, toboggan handling, risk management, hill safety, rope rescue, avalanche control, explosives, transceivers, and first aid. APP holds several 2-day mid-winter clinics and a 5-day spring clinic throughout the west, where members gather to share information and test new candidates. At these clinics, innovations and new equipment are demonstrated and discussed, along with guest speakers covering a variety of patrol related topics. Education being the primary goal of the organization, APP has sponsored a number of quality Risk Management and Avalanche workshops in an attempt to fulfill needs of both the novice and experienced pro-patroller.